Kofun are megalithic burial mounds in Japan, which were constructed between the late 2nd century and early 7th century. In particular zenpo-koen-fun (*) are characteristic of Japan and interpreted as the tombs-style related to the ancient Yamato court: the descendents of Yamato rulers have reigned over Japan as emperors till today. 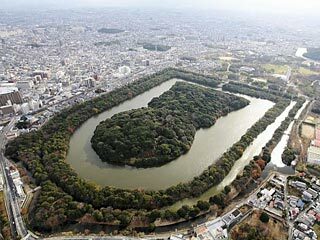 Keyhole-shaped burial mounds: the Japanese terminology literally means "Square-front and round-rear mound". The first massive zenpo-koen-fun "Hashihaka" built in the late 3rd century is often thought to be the tombs of the legendary Himiko, the first Japanese ruler and shamanic queen mentioned in an official Chinese history book. Daisen-Kofun is the largest tombs in Japan and as to its length it is also the largest in the world. 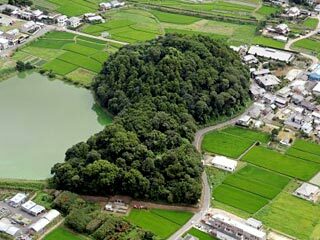 While there are 161,560 Kofun existing in Japan according to the Agency for Cultural Affairs. There are also at least eleven zenpo-koen-fun in the south-western region of Korea, which were constructed between the end of the 5th century and middle of the 6th century, and discussions are going on both in Korea and Japan about the nature of those tombs. Archeologists and historians complain that the most important tumuli are inaccessible, because the Imperial Household Agency does not allow them to excavate the ancestors' tombs of the Emperor. I feel some sympathy for those scholars, but find it also not bad to prohibit excavation, because I believe that the dignity and repose of the deceased should not be easily sacrificed under the pretext of so-called scientific necessity. There 213 Kofun in the prefecture Tokyo. The largest one exists next to Tokyo Tower and its hill-top area gives me a good place for taking lunch and relaxing during lunch time break. Maruyama-Kofun is 106m long (*) and the largest zenpo-koen-fun in Tokyo. Its square part is 40m wide and 6m high and round part is 64m diameter and 8m high. Between 1897 and 1898 the top part of the round mound was excavated by Professor Shojiro Tsuboi, but no tombs structure was identified. A few ceramics and terracotta figures were found, but they might have originated from the surrounding small round tombs, which are abundant with relics. 106m is the size mentioned in the text of the explanation board. 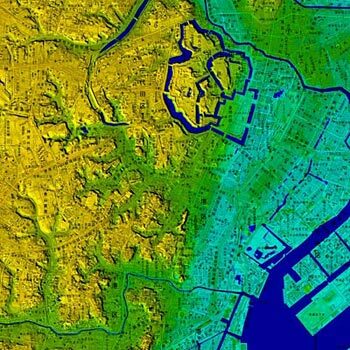 But, measurement of the mound resulted in 125m and this length in registered in the ruins index of Tokyo. Experts say that the length is estimated to be 112m in light of the zenpo-koen-fun model. It is difficult to judge as an amateur. Maruyama Kofun seen from the western side. The left part of woods is the round part and the right part is the square part. The top part of the round rear mound was removed already during the Edo Period (1603-1867) and there stood a tea pavilion when Professor Tsuboi made his research. There are only few clues and even experts find it difficult to identify the construction time. Anyhow, from such facts that it is located at the tip of the Musashino diluvial plateau (colored yellow on the map left), that the square front part is narrow and low and that it is isolated from other tombs of the same age, some experts guess that Maruyama-Kofun was constructed in the late 4th century and others say in the 5th century. It belongs to the early style of zenpo-koen-fun and must have been the tombs of a local ruler who pioneered this area, cultivated paddy field in the nearby alluvial lowland and controlled the north-south traffic route. Maruyama-Kofun is located between Toshogu (*) and the Prince Park Tower Hotel in Shiba Park, whose area originally belonged to Zojoji-Temple, one of the two grave places of Tokugawa Shoguns in Tokyo. Zojoji-Temple is now confined to a small part of the original territory and the rest is used among others for Tokyo Tower, two hotels and park. One of the four Toshogu to enshrine Ieyasu, the founder of the Tokugawa shogunate. I find it almost a miracle that an old grave mound could survive 1700 years and recent 400 years in the midst of a mega city. The hill top is now decorated with a monument dedicated to Tadataka Ino (1745-1818) who made the first map of Japan using modern surveying techniques. Ino made here his survey rehearsals. Another monument standing on the square part of the mound is dedicated to a LDP politician. I cannot agree to the idea to construct a monument for this person in a public place. Compared with Tadataka Ino, this politician is nothing. There is a small Inari shrine on the side of the tumulus at the juncture of the square-front and the round-rear. Inari-god here has a special nick name "Follower". When Buddha of Zojoji he moved from Kuwana to this place, this Inari-god also followed him and stayed here to protect the temple. Shinto and Buddhism were interlinked and mixed for centuries in Japan and this is a small piece of evidence for this cohabitation. 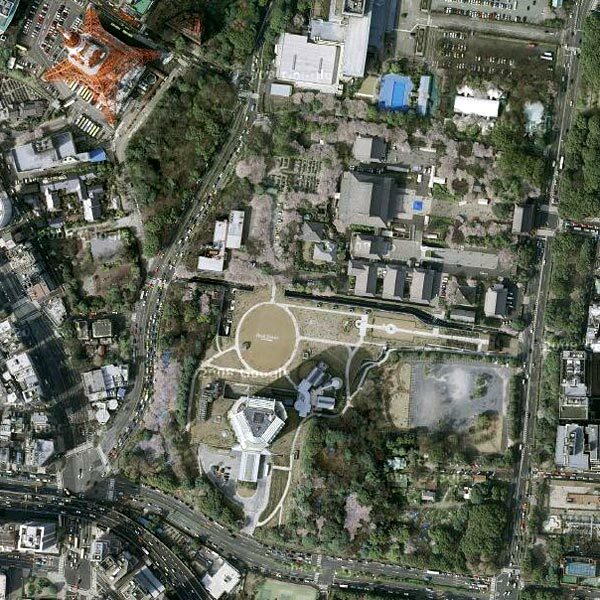 The Google Sattelite Image gives us a real image of Maruyama Kofun and its surroundings. You can see Tokyo Tower, Zojoji (Park Tower Hotel and Tokyo Prince Hotel exist on the areas where there were Shoguns' graveyards existed.) and Hojuin in other articles.